Laugh a lot till you breathe; Love as long as you live! 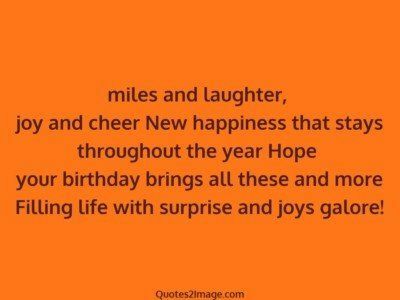 miles and laughter, joy and cheer New happiness that stays throughout the year Hope your birthday brings all these and more Filling life with surprise and joys galore! Alone I can say but together we can chat; Alone I can smile but together we can laugh; Alone I can enjoy but together we can celebrate. This is the magic of our Friendship! If you think positively; Sound becomes music; Movement becomes dance; Smile becomes laughter; Mind becomes meditation; And life becomes a celebration. You can eat and drink together, talk and laugh together, enjoy life together, but you are only real friends when you also cried together. 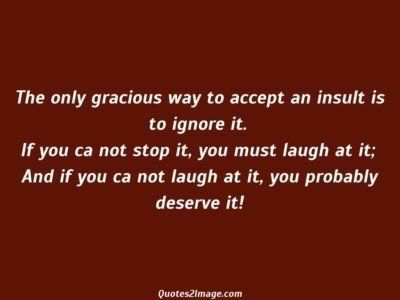 The only gracious way to accept an insult is to ignore it. 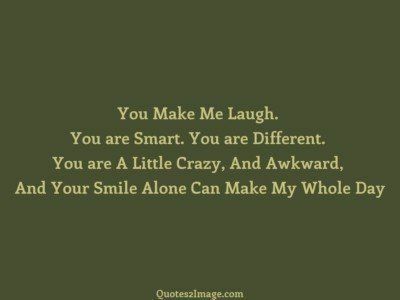 If you can not stop it, you must laugh at it; And if you can not laugh at it, you probably deserve it! 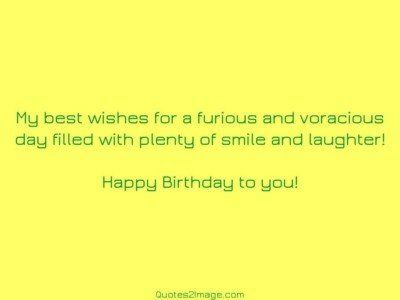 My best wishes for a furious and voracious day filled with plenty of smile and laughter! Happy Birthday to you! 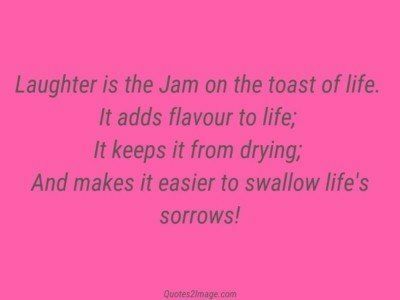 Laughter is the Jam on the toast of life. It adds flavour to life; It keeps it from drying; And makes it easier to swallow life’s sorrows! I love the way you smile, Love to hear your laughter, I love loving you because you are My happily ever after.